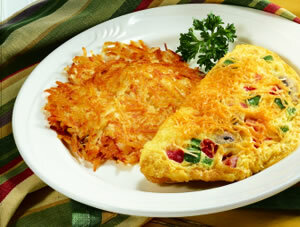 Omelette is one of the popular breakfasts in the western countries and a dish liked by most of the people. Omelette is very easy to prepare. Omelette is a dish made from beaten eggs adding spices and fried on a frying pan. Egg is the main ingredient in preparing the Omelette. Eggs are highly nutritious and a good source of protein and choline. Choline is the important nutrient for development of brain. Intake of egg is very good for growing children. But high intake of egg increases cardiovascular risk in diabetic patients and also increases risk of type 2 diabetes in both men and women. Omelette is thought to have originated in the ancient near-east. According to the history of giant Easter omelette of Bessières, Haute-Garonne, when Napoleon Bonaparte and his army were traveling through Southern France, they decided to rest for the night near the town of Bessières. Napoleon feasted on an omelette prepared by a local innkeeper that was such a culinary delight that he ordered the townspeople to gather all the eggs in the village and to prepare a huge omelette for his army the next day. On March 19, 1994, the largest omelette in the world was made with 160,000 eggs in Yokohama, Japan, but it was subsequently overtaken by an omelette made by the Lung Association in Brockville Memorial Centre, Ontario, Canada on May 11, 2002 — it weighed 2.95 tonnes (2950 kg). You can have variety of fillings like Cheese, vegetables, meat, ham, mushroom etc. To have a fluffy texture to the Omelette, whole eggs or sometimes egg whites only are beaten with a small amount of milk or cream, or even water, the idea being to have "bubbles" of water vapor trapped within the rapidly cooked egg. The bubbles are what make the omelette light and fluffy. Omelette to be cooked on both sides till it gets a little golden color. Dishes like the French Omelette, Spanish tortilla etc were adapted from the original recipe of Omelette and spread to other countries by the people who had travelled to Western Europe via the Middle East and North Africa.People of India prepare Omelette according to the spices available regionally and their liking. Common ingredients like the chopped green chillies, chopped onions, coriander leaves, pinch of turmeric, chopped tomatoes are used to prepare the omelette. Some of them also use ginger garlic paste, chilli powder, dhania powder etc. Bread omelette is one of the popular breakfast common every where.